In today’s post, continuing the fine points of blogging, I would like to discuss picking a hosting home for your blog, as well as choosing a visual format. If your company does not have its own blogging software included in the website program, there are dozens and dozens of blogging sites that you can create a blog and link it to your company site. WordPress is very popular with corporate blog use – in fact, we use WordPress here at Ninthlink! WordPress is extremely user friendly, easy to manage, tracks visitors by where they have found your blog, either via a search engine or a link from somewhere else. WordPress boasts the ability to import journal entries from other blogs, meaning that moving over to WordPress is not too complicated a task. Some of the more recent features of WordPress, such as CSS editing, domain mapping, and increased storage space, are only available for a fee, but the free service is more than adequate for most users. Blogger is often used by companies who have outside bloggers discussing their product. For instance, a diet pill product, or a beverage, or clothing, will provide bloggers their product for free in exchange for weekly blogs that discuss how the product has affected their lives. The added advantage of the ability to set up Google AdSense advertisements on this site means that you can earn some pocket money from site visitors. A major benefit of a Blogger account is that users can choose to use their own Domain Name for their blog, and can also host their blog externally if they wish. The Google toolbar features a button that says BlogThis!, which, when clicked, allows the user to post a blog entry about the page they are viewing. Typepad is a paid blogging service which gives users a lot of flexibility and powerful features without the need for much technical knowledge. Multimedia such as video or music are easily added to TypePad blogs, and users can also embed functionality from various websites including Amazon and Skype, as well as choosing whether and how advertising should be included. Detailed site statistics are also available to some users. Squarespace operates with the small business and self-published authors in mind, a B2B platform for networking and cross-pollination promotion. 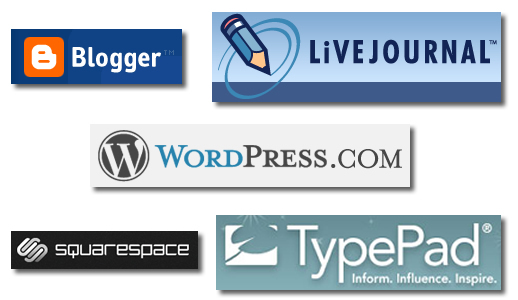 Livejournal is generally a social networking blog but has been used to promote books, CDs, and services. Other users can link to the blog and discuss the product among each other. You can set up a blog for free, and customize its look and feel using predefined templates or your own HTML. You can also choose to upgrade your account with paid features which allow you to edit a few more aspects of your journal’s look and feel; upload more user icons; and create voice posts and user polls. LiveJournal’s unique selling point is its focus on social networking; users can add others to their Friends List (sometimes called a flist), giving them special permission to view higher-security entries. Friends’ entries are also displayed on a user’s Friends Page. Users who share interests can find one another using the interest search features. Once you have chosen your blog provider and set up an account, you will need to choose a design look. The provider will start you off with a basic design. All of these providers have hundreds of templates to choose from, created by past designers who specialize in nifty blog visuals. Keep in mind who your audience is, what you main subject matter is, and how a look will enhance these aspects. For instance, if you are blogging about living in Alaska, or about ski and snow gear, you may want to choose a blog design with blues and whites and that says, “Winter!” in its overall look. A blog about islands, the beach, or suntan lotion will want to choose a blog design with green, blue, and yellow, and a “Summer!’ look and feel. Your blog design should express who you are and what your company and product is visually. More importantly, you want it to be pleasing to the eye. Some designs can be altered for free as well, to further individualize it. Questions about blog design and providers? I’d love to talk to you about this! Contact me at [email protected] or 858.200.9060.